Sellers of both brand-new homes and bottom-of-the-market houses are reacting to the shift by lowering prices and offering deals to prospective buyers. 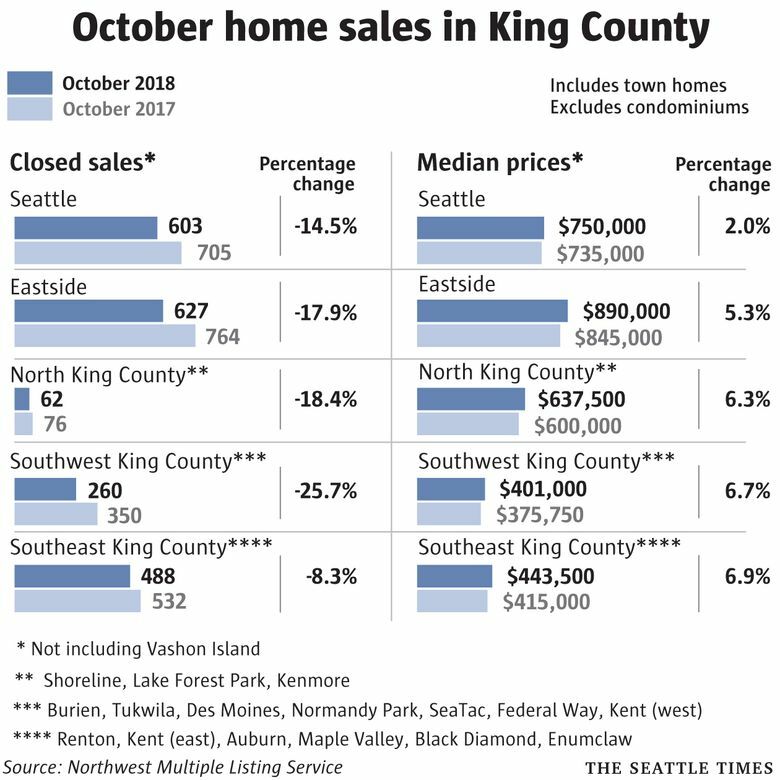 The number of homes sitting unsold in King County has doubled in the past year as buyers continue to retreat from the once-hot market — pushing prices in the city of Seattle down even further. Inventory countywide jumped 86 percent among single-family homes and 188 percent among condos in October compared to a year prior, according to monthly data released Tuesday by the Northwest Multiple Listing Service. It was the largest year-over-year increase on record, dating back to 2000 — breaking the previous mark set just a month prior. In the city of Seattle, the median home price fell to $750,000, down $25,000 in one month and down $80,000 from the record set in the spring. That’s not a normal seasonal drop – prices in the city actually went up during those time frames last year. Even compared to this time a year ago, prices ticked up only 2 percent, or less than inflation. Interest rates that have grown in that span have increased monthly mortgage costs, however. On the Eastside, the median home sold for $890,000, unchanged from the previous month and down $87,000 from the all-time high a few months ago. Prices were still up 5.3 percent vs. a year ago. Prices also dipped slightly on a month-over-month basis in South King County but surged at the northern end of the county. A few more people are putting their homes on the market but the shift continues to be largely the result of buyers taking a step back; countywide, sales fell 16 percent in October from a year prior. 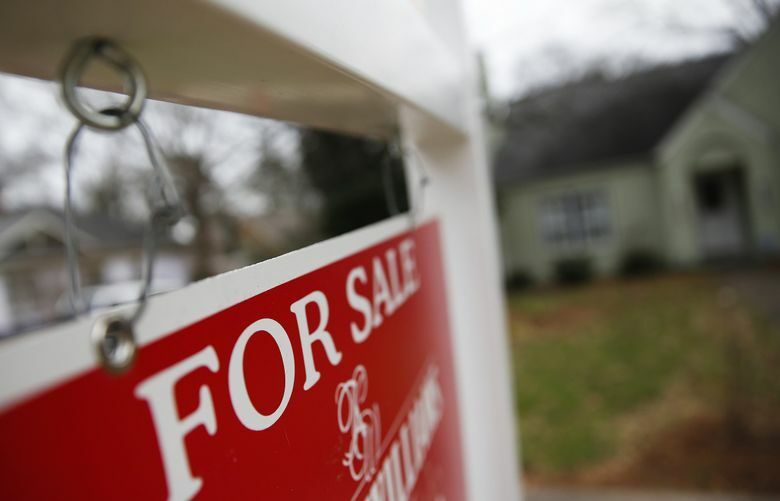 Sellers have reacted by cutting list prices faster than any other metro area in the country. And buyers are now negotiating prices down even further, as the average home is selling for below list price for the first time in four years. For the first time in a while, there’s even a single-family house with a yard for sale in the city limits of Seattle for under $300,000: A small, older home in Highland Park that failed to sell for $328,000 last month is now offered at $299,000. Altogether there were 17 houses for sale in the city for under $400,000 on Tuesday, including seven with price cuts. Even builders of new homes have had to make discounts. When the new Gridiron condos in Pioneer Square opened in March, developer Kevin Daniels announced 75 percent of the 95 market-rate condos were sold or pending. But seven and a half months later, officials at the building said the total that had actually followed through with a purchase was 57 percent. The Gridiron has now resorted to offering buyers a significant deal: It’s partnering with a local bank to offer condos for 3.5 percent down; compared with the average of about 20 percent down, buyers can save about $100,000 in up-front costs on a one-bedroom. And it’s offering below-market mortgage interest rates starting at just 2.5 percent in the first year – a savings of nearly $700 a month over current rates, which are hovering near 4.8 percent. A combination of rising interest rates, burnout from buyers and flat-lining rents have helped tamp down homebuyer demand over the last six months. And more recently, brokers have reported that buyers who had been in the market are now pausing as they wait to see how far the market can fall. Ken Graff, a broker with Coldwell Banker Bain in Seattle, noted he put a town house in Magnolia on the market in April – right before the apparent peak of the market – and it quickly got 11 bids and went way over asking, selling for $800,000. In September, he put the neighbor’s identical town home for sale and it stood unsold for three weeks before selling for $725,000. 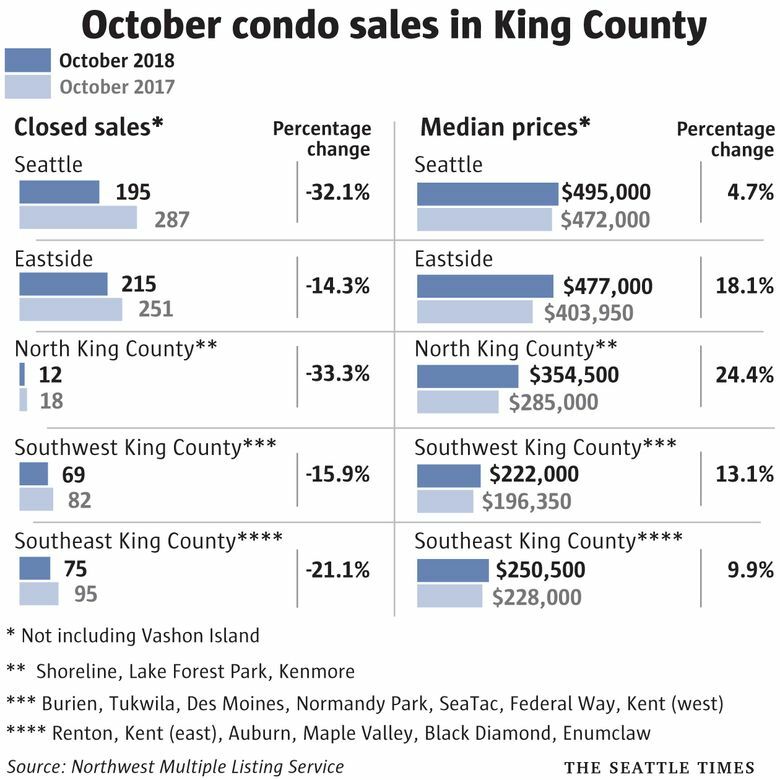 Among the places where single-family home prices dropped in October on a year-over-year basis: West Bellevue, Southeast Seattle, Burien-Normandy Park and the Skyway area. On the other end, prices rose more than 10 percent from a year ago in Jovita-West Hill Auburn, Auburn, Kent, Renton-Benson Hill, Mercer Island, Kirkland-Bridle Trails and Juanita-Woodinville. Elsewhere, the rest of the Puget Sound region also saw growth in inventory, including a 65 percent increase in Snohomish County. 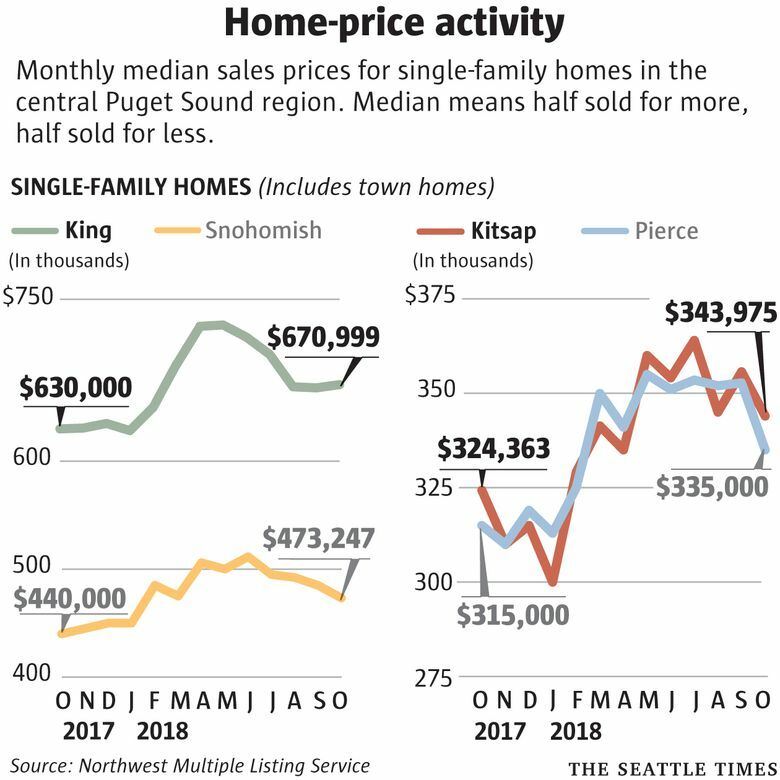 Year-over-year, single-family home prices grew 7.6 percent in Snohomish County, 6.3 percent in Pierce County and 6 percent in Kitsap County. Current median prices — $473,000 in Snohomish, $335,000 in Pierce and $334,000 in Kitsap — are all down from their highs reached earlier this year, however.